Welcome to the newest feature at Butterfield Trail Golf Club. Our Superintendent, Brad Wise, has been with Butterfield Trail since the grow-in in 2007 and has extensive knowledge in agronomy, golf course design, and maintenance of the facility. If you have a question about the golf course, Brad can help you out! It's Windy Season here in El Paso, TX. 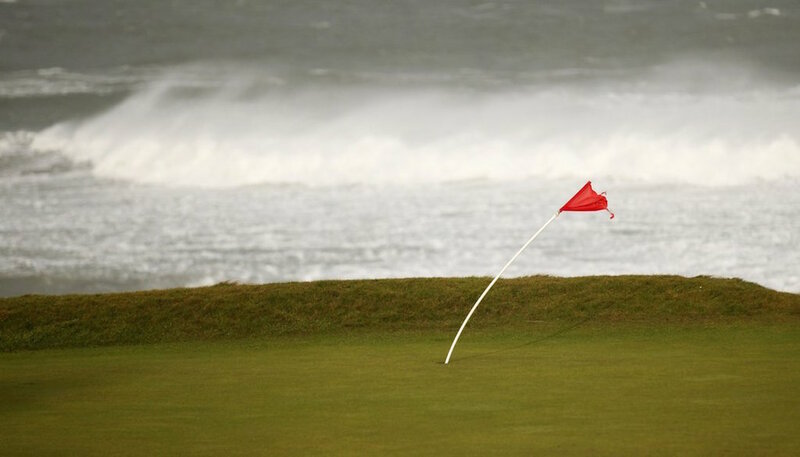 What effect does the wind have on a golf course? It’s that time of the year………. windy and dusty! Today we are going to talk about the wind and its effects on the golf course. It’s taken us numerous years to try to figure out the wind in order to properly maintain the golf course. We may never figure out the wind, so to speak, but we have been able to figure out methods to work with wind. Some of the methods are very visual and obvious such as the wood wind fences we have installed on the westerly sides of the golf holes or the rock wall that surrounds the golf course. Each time we have a wind “event,” the construction of the two walls save us days of clean-up work on the golf course. Prior to the completion of the wall projects, one 50+ mph wind event could require 3 weeks of clean up and during this time of the year it is common to receive 40 – 45 mph winds 3 - 4 times per week, in addition to the strong wind occurrences. The gradual effects start to compile year after year due to not being able to entirely remove all the sand that blows onto the golf course. The sand that we have in this region is a very fine silty sand that has a low water percolation rate. When this sand slowly builds up in the turf it can begin to lower oxygen holding capacity in the soil. This can then cause inconsistencies in the turf on the course, especially being that the majority of these areas are in the rough cut. If no agronomical changes are made you could have a low cut fairway, then a high cut rough, then again what would appear to be a low cut irregular area on the edge of the same golf hole due to having turf that is growing in a compacted, wet and high blow sand soil. In order to relieve these areas, we aerify the turf numerous times per year and apply wetting agents to increase oxygen levels and encourage vertical growth. The most significant challenge on the golf course during the windy season is the greenside bunkers. Yes, more bunker talk! The wind events are one of the major reasons that we began renovating the bunkers approximately 9 years ago. The original bunkers had sand from the floor of the bunkers through the bunker face all the way up to the bottom of the rounded turf slope. During wind events this was basically a ramp for sand to be blown onto the greens surface. Regarding the high silt content of the sand this can be extremely detrimental in trying to maintain greens in the summer heat. In addition, the high silt content would cause the bunkers to remain very wet and compacted after a wind event. By the time the bunkers were dried out, loosened and manicured it was time to run water during another wind event. The reason we run water during wind events is to keep the bunker sand in the bunker and not on the greens surface. During the first couple years of operation we had numerous greens completely covered with sand/silt and debris from wind events. Green number 3 in particular has taken 18 hours to clean the in the past. The green was covered completely by 1 – 2 inches of sand over the entire surface of the green. The process to clean a green in this scenario is extremely labor intensive, time consuming, and delicate, as to not cause further damage to the turf - in this case creeping bent grass being grown in a desert climate. It is a bit of a chess match trying to get the bunkers back to their manicured summer playability while running high amounts of water during wind events. The irrigation cycles compact the bunkers during the wind event which is exactly what we want despite knowing they need to be dry the very next day so we can continue to prepare the bunkers properly. In addition to this the greens get dried out during wind events causing needed irrigation cycles the day after the wind event and the overspray from the greens heads further add moisture to the greenside bunkers. This is why we have changed the sand mixture in the formal greenside bunkers which was installed during the renovation process. The new sand mixture dries out much quicker, which in turn adds to a quicker process preparing the bunkers after wind events. On our calm days we will add the tiller into the preparation process to speed up bunker quality and playability. During the windy season this will be an ongoing battle that we will continue to make improvements on. On days that heavy wind is forecasted, it is not uncommon to receive notice that all bunkers can be played as ground under repair as we are already prepping for the windy afternoon. Likewise on the beautiful spring days we will be working the bunkers with the tiller to get them to the best possible playing conditions and aesthetics for your round! Thanks for your patronage to BTGC, we look forward to seeing you soon!